With total surrender and deep gratitude in my heart for Mohanji and the Tradition, I present below an account of the pilgrimage to Ganeshpuri and Shirdi with Mohanji. He is only inspiring me and writing this account through me. I feel so blessed! The programmes for both days, i.e. 20thand 21st June, 2012 were totally unplanned, except the decision to travel to Ganeshpuri on 20th June. No detailed schedules were chalked out in advance, but everything happened with clockwork precision because the Tradition was running the show. The Tradition is such that it takes care of all aspects. Look at the life of Bhagwan Nityananda, Akkalkot Maharaj, Sai Nath Maharaj etc. With Mohanji’s grace and blessings, I have experienced such smooth pilgrimages and great darshans. Even before in Oct 2010, when some of us went with Mohanji to Ganeshpuri. It was my first visit then and ever since I feel so at home whenever I am at Ganeshpuri. 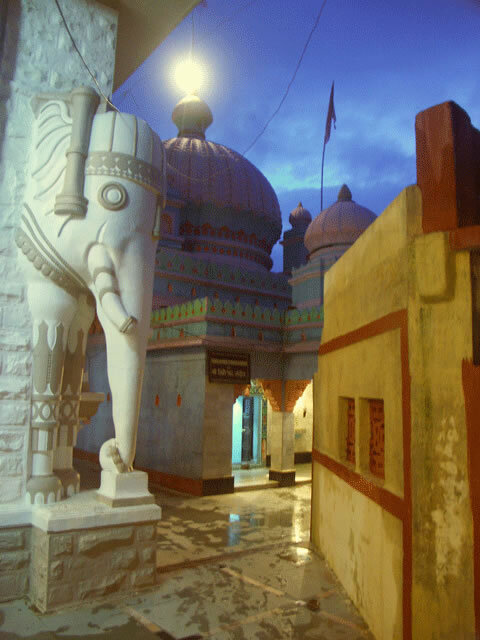 Ganeshpuri in the Thane district of Maharashtra, India is about 56 kms from Thane city near Mumbai, a small village enroute Bhiwandi about 15 kms from the Virar road exit at National Highway connecting Mumbai to Ahmedabad and easily reachable by road. 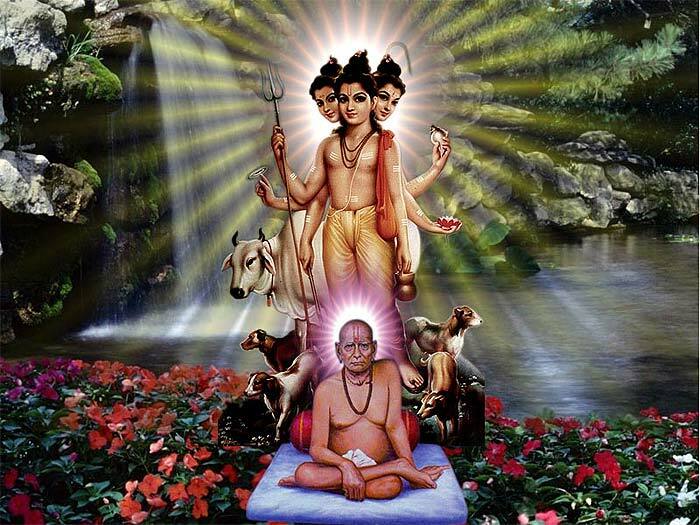 This holy abode of Bhagwan Nityananda- Dattatreya’s avatar is alive with His energy all the time. In His energy field one has no option but to be in the present. It is also true that unless He calls one cannot reach Ganeshpuri. Bhagawan Nithyananda or Bade Baba had been calling me to His abode at Ganeshpuri. I wanted to visit Ganeshpuri sometime earlier in the month but somehow I could not. On 19th June 2012 Rajeshwari called to inform me that Mohanji would be in Mumbai and that on 20th June 2012, He would be visiting Ganeshpuri. I was very happy and was also very strongly inspired to join Him in Ganeshpuri. A pilgrimage to Ganeshpuri with Mohanji is a great divine blessing! On 20th June, early morning around 5am, four of us (Mohanji, Rajeshwari, Prakashji and myself) met at a common point and drove down to Ganeshpuri. Enroute, it started raining heavily, a real downpour and visibility was very poor. Mohanji said that it was meant for cleansing and would stop at the right time. It stopped raining exactly when we got out of the car at Ganeshpuri. What a miracle!! Then some chantings in Sanskrit made the whole space vibrate with Baba’s living energy. Our minds got shut off and we were completely in the present state. Our whole being was one with the chantings and the aarti. Inside it was deep silence and in that silence only Divinity dwells. After aarti was over, all devotees stood in a queue to have His Darshan and bow to Him at His padukas. Some of them had flowers, coconut or money as offerings! One priest by the name of Prasadji was connecting very strongly with Mohanji, even though they had never met before. He prepared a special Karpoor Arathi and asked Mohanji and all of us to do Karpoor aarti to Baba and sing His aarti once again. We did this with our utmost devotion. Then he sat with us and started talking about Baba and all His leelas. He said for him Ganeshpuri is everything as all divine energies dwell here. 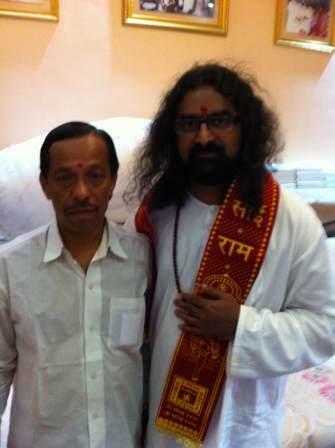 He mentioned that Baba being the Datta avatar, where else would one go. He has all divine energies with Him. He mentioned that for his mother’s Shraddha ceremony he did not go anywhere, but did the same at Ganeshpuri by the shore of Tansa river. He is a classical singer and sings bhajans (devotional songs) at the Samadhi Mandir and he very willingly offered to give us a CD of his bhajans. While we were leaving for the rest of the darshans, an old, fragile and saintly person came running from behind and fell at the feet of Mohanji shouting “Bhagawan! Bhagwan ka darshan hua”(I saw the Lord). Mohanji recognized Him and He too recognized the divinity in Mohanji and His state. Mohanji said He is an Avadhoota i.e. a completely liberated being and invited him to have breakfast with us at the Annapoorna canteen run by the temple trustees. Another old saint also came and bowed down to Mohanji as we were standing at the gate. At the restaurant, Mohanji asked me and Prakashji to feed anyone looking for food and we did so. It was so fulfilling. We were immensely enriched from within. Not only our stomachs, the smiles of happiness on the faces of the saints and wandering people after a good meal, filled our hearts too. Mohanji was delivering liberation through practical examples. Then we visited Baba’s residence Kailash Bhawan. All the rooms and articles there were full with His energy. The attendant brought Baba’s abhishek water to drink as blessings. We bowed at the chair and the beds He would sit or lean upon. Then we visited Baba’s close disciple Paramahamsa Shaligram Swami’s Samadhi and paid our devotion there. Shalig Swami to Bade Baba is like Hanumanji to Sri Rama. He is an epitome of surrender, devotion and tremendous Guru bhakti. He always wanted to take Samadhi before Bade Baba and requested Him to grant him this as he could not have tolerated Bade Baba’s Mahasamadhi before him. The ever benevolent Bade Baba delivered this wish to his favorite disciple. This is his Jeeva Samadhi, where he attained Samadhi alive. Then we went straight to Bangalorewala Mansion first floor where Baba took His Mahasamadhi just a few months after Saligram Swami’s Mahasamadhi. The bed where He took Mahasamadhi and all the articles in His rooms there are as alive and intact as if He were physically there, but Bade Baba is Parabrahma and is there everywhere and in all beings! When you walk in darkness, you have fear. But in light, there is no fear. Ignorance is darkness. Knowledge is the light. Guru is such a light. Light is guru. Next we proceeded to the other bank of the river Tansa just opposite Bade Baba’s Samadhi Mandir where there is an ancient Mata Anusuiya temple. Mata Anusuiya, the wife of Rishi Atri, is the mother of Lord Dattatreya! Here there is also a Shiva linga which is Swayambhu, the temple was consecrated by Bade Baba Himself. Next to this is the Rakhadi Baba ashram. Rakhadi Baba was a direct disciple of Bhagwan Nityananda. When Mohanji entered the Shiva temple, he seemed a bit affected because there was no water dripping on the Shiva linga. It was dry. Mohanji asked me to fetch some water and pour it on the Shiva linga and also to water the tulsi plants outside the temple, but there was no source available as the ashram was also closed. We poured the drinking water we were carrying and for more, there was no alternative than to bring hot water from the hot water springs (3nos) nearby. Just as I finished pouring water on the Shiva lingam and Rajeshwari watering the tulsi plants, we saw the Ashram attendant Swami come running towards us. He fell at Mohanji’s feet and started kissing His feet. He later mentioned that He saw his Guru in Mohanji. He opened the ashram and with great reverence and honor, requested Mohanji to perform Karpur aarti on Rakhadi Baba. Remember, he had not met Mohanji before and there had been no formal introduction! He saw His Guru in Mohanji and he had no doubt that Mohanji was his Guru indeed! It means that all Masters use any form to convey the eternal truths or in other words there is nothing called “All Masters” there is only GURU. One single entity and multiple expressions. It is our illusion that makes us feel that bodies are different and so are masters. All masters are one and this was a practical lesson regarding that fundamental truth. After this we were cordially invited and we sat in the ashram room next door for some time. He gave Mohanji flowers, udi, water and some books about Rakhadi Baba and His disciple Swami Purnananda (whose ashram is in Sri Sailem in Andhra Pradesh, India). The Swami accompanied us to the car and bowed with reverence to Mohanji as we were departing. It was such a fulfilling experience. Two important messages from the Tradition were delivered through practical means. Never leave a Shiva linga dry. The symbol of Ganga on the head of Shiva itself is symbolic of continuous nourishment. 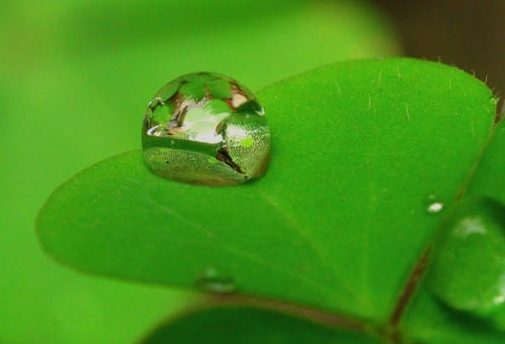 Not a drop of water trickling down the Shiva linga will be wasted. It makes dissolution painless. It would be added to making life more and more complete. The tulsi plant is mother earth as well as the favorite of Lord Vishnu, the Lord who protects and nurtures life. Nurture the tulsi plant, which has an aura 18 times of its size. It keeps the environment energized. It nurtures health and spiritual life. It adds to grace. Another aspect that struck us was that Mohanji was with us as Mohanji. But, the Swami saw his Guru in Mohanji – which was so real for him. So, who actually is Mohanji? We cannot take anything for granted. We need to keep our inner eyes open at all times to witness the truth. Tradition is like an eternal river. It continues to flow. There is no beginning there is no end. All the differentiation such as physical form, ideas, and knowledge – everything conglomerates into one. So the tradition is eternal. It began before the time began or when the time began. It will continue till the time ends. At each point in time, somebody will come up to express the path, the tradition. Outside the ashram there is a very rare tree that has flowers like Sheshanaga and Shiva linga inside its core. Normally the flower of this tree is used for worshiping Shiva. We circumambulated this tree too, with deep devotion. Then we took the turn towards the shops around Samadhi Mandir of Bade Baba which had opened by then. There I bought Lord Dattatreya idols for myself and our friend Murari (Muscat). Mohanji asked me to take an idol of Swami Samarth in addition. In fact I had been having constant thoughts of Swami Samarth over the last few days and had not told anyone. It therefore surprised me when Mohanji asked me to buy an idol of Swami Samarth as well. Mohanji energized all the idols and I could actually feel that they became alive! I felt very blessed and we all left to meet Swami Sevananda, the Head of the Indian ashram of Swami Muktananda (another close disciple of Bade Baba) at Gaondevi near the Samadhi Mandir of Bade Baba. Mohanji has a close bonding with Swami Sevananda. Obviously, they love each other a lot. 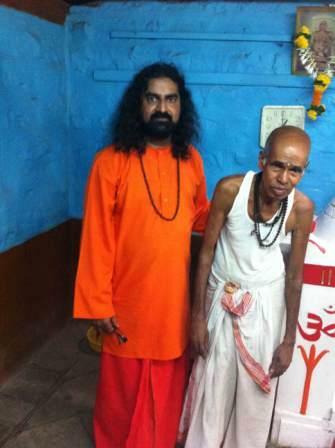 Swami is in his 70’s, a frail but youthful, charming saint. Mohanji never leaves Ganeshpuri without meeting and hugging Sevananda. We waited for him at the guest room near the bookstore. Mohanji greeted him with a warm hug and a lot of overflowing love. He presented to him the dry fruits that He had brought for him from Oman. After we chatted for a short while, since it was time for arathi, Swami Sevananda suggested that we go to the main temple at Swami Muktananda ashram for Bade Baba’s aarti. On the way we bowed at Devi’s temple. At the main temple we all chanted Shiva stuti after the aarti to Bade Baba. The whole space was vibrating with divine energy. Swami Sevananda gave us holy water and special flowers to Mohanji. He blessed Mohanji whole heartedly and we departed, our hearts filled with gratitude for being alive and being present. Very close to Vajreshwari, another 1.5 kms away, is a small village Akloli where Bhagwan Nityananda came and stayed for nine years before He shifted to Ganeshpuri. Here are also hot springs of water, an ancient Shiva temple, a Hanumanji temple, a Sai Nath temple and Bade Baba’s temple where He would sit. However we could not visit Akloli and after a great day full of divine bliss we all left for Mumbai. The day was so full and complete as well as overwhelming. The day was very fulfilling with all the powerful darshans and realizations. The whole programme had been well orchestrated with Divine, smooth uninterrupted sailing and no prior detailed preparations on our part. We stayed completely in the present. Mind was completely shut off. Each trip with Mohanji is a lesson of being in the present and the flow of grace at each point. A great fulfilling Pilgrimage to Ganeshpuri that was only possible with the grace and blessings of the Master! All masters are ONE. What a practical way of understanding this eternal truth! Mohanji and three of us visited the Shirdi shrine of Sai Nath on 21st June 2012. Originally Mohanji had decided to stay over at Shirdi on 21st June but then He changed the plan to make a day trip and return to Thane instead of Juhu so that the next day i.e. 22ndJune He could do a satsang that many devotees were waiting for in Thane. On 21st June Mohanji came with Prakashji to Thane and we all met at Hiranandani Meadows near Rajeshwari’s residence at 6.30 am and without wasting time we took the Nashik highway, enroute to Shirdi, about 220 kms from Thane. Our intention was to attend the noon aarti. After travelling for about 100 kms, we stopped at Manas Lifestyles Resorts at Igatpuri, again quite unplanned, and had a sumptuous breakfast. We reached Shirdi at around 10.45 am. Meanwhile Rajeshwari was coordinating with someone at Shirdi for the passes to enter the shrine. We stopped near gate no.1 and went straight to the counter for the special passes. By Baba’s grace everything was well arranged and we got the passes. We entered through gate no. 1 and waited near Ganapati, Shani and Shiva temple inside, for some time, until the gate opened. Meanwhile we took darshan of Lord Shiva and the Deities in the temple and took their blessings. Across the road, inside the shrine campus there was a queue of devotees waiting for the noon aarti. Then everybody started moving towards the Samadhi temple and we also joined them. We went inside the temple smoothly and soon we were in front of Shirdi Baba. It was Thursday, Baba’s special day when there is a large crowd in the temple for Baba’s darshan. This was also my first visit to Shirdi on any Thursday. Normally I would visit on other days and not on weekends to avoid crowds and long queues. Despite this, with Baba’s grace and blessings it all went very smoothly and was well orchestrated. Mohanji is one with Baba and a pilgrimage with Him is always special. We had a very grand darshan and went through the entire aarti. The whole space was vibrating with Baba’s live energy. Mohanji had brought chocolate sweets with Him from abroad for Baba and after Baba partook of the same and blessed, Mohanji distributed the same to everyone around there. When Baba was in His physical body, people used to bring many types of sweets to Baba and he would perhaps take one and ask them to distribute it to the devotees. We did the same, as this was Baba’s wish. We also went near the Neem tree (Baba’s Guru’s place) and bowed. Then we went to Dwarkamai (Masjid) where Baba’s dhuni remains perpetually lit. Baba used to spend most of His time there. 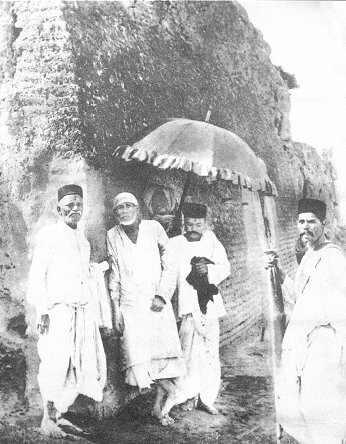 Mohanji showed me a group photo with Sai Baba with His devotees. He asked me to look specifically at the one right next to Baba. There was some special significance. I was happy to have darshan of Baba in the form of His picture kept at the stone where He used to sit. Then we all proceeded towards Chavadi, a place where Baba also used to sit and often meet devotees. We sat there and meditated for some time, basking in and soaking up, the energy there. Then we moved to the Hanumanji temple. Hanumanji is Shiva, as is Sai. All are one. Finally we entered a bookstore where Prakashji bought a big statue of Shirdi Baba as per Mohanji’s instructions and we bought some copies of a book called Sai Baba The Master by Acharya Bhardwaj. As per Mohanji, this is a well researched book on the life of Sai Baba and this book is not always available. We also bought some Prasad for everyone. Then we all proceeded towards Prasadalayam to have Baba’s lunch Prasad. The food was very sattvic and sumptuous. The dining hall was very neat and clean. Baba always loved to feed devotees and cooked with His own hands. The very remembrance of this was giving intense good feeling! This also reminded us that Mohanji was the inspiration behind the recent opening of a sattvic vegetarian restaurant in Gurgaon called Madhuban, aimed at nurturing the philosophy of sattvic food, and based on the teachings of Mohanji. The Tradition fulfills in all aspects indeed! Originally we thought of returning back to Thane from here, but with Mohanji one can always expect changes. Nothing is assured and fixed, but he ensures there is no pain or tedium due to deviation. He keeps everybody fresh and energetic and none feels tired! He does not waste any time in unnecessary waiting or talk and His existence is always purposeful! He found through his inner eye and with His awareness that many devotees had prayed and were waiting for Him at Srirampur at Dr. Jyoti’s residence (Dr Deepali Jaju’s sister) about 40 kms from Shirdi. So Mohanji suddenly changed the whole programme and instead we moved towards Sri Rampur, right after lunch. Meanwhile Rajeshwari contacted the Chief Priest of the Shirdi Baba Shrine, Solaiki Maharaj as Mohanji wanted to meet him and it was agreed that we would meet him on our way back from Sri Rampur. We reached Sri Rampur around 3.30 pm. Dr Jyoti and her entire family were waiting for Mohanji and they welcomed us with traditional tika and aarti. Then many devotees suddenly gathered and within a few minutes things changed to a spontaneous satsang. Mohanji had a question and answer session, beautifully translated into Marathi by an inspired Rajeshwari, and a few one to one personal meetings. Mohanji was already in a high state and decided to give Shaktipat to all gathered there. The whole session was very intense. Before the session, devotees had many questions and anxieties. Some were even skeptical, but after the session and Shaktipat, everyone got what they needed and was totally melted and dissolved in the high energy. The Shaktipat was very intense and I experienced a shift in my consciousness deep inside me. Thereafter we enjoyed the hospitality of Dr Jyoti’s family and had some light snacks, including a local sweet dish Shira and tea. Meanwhile Dr Jyoti’s husband, also a doctor, showed us his hospital in the residence premises and took Mohanji’s blood pressure that was found normal. Then we all left for Thane back, enroute Shirdi, at about 6 pm. Mohanji’s unplanned satsang at Sri Rampur demonstrated Master’s sheer unconditional love and compassion for the devotees and His unframed state of mind as He lives in a higher state of consciousness all the time. He is spontaneous and always available in multiple planes. Whenever a devotee connects, he appears, physically like this incident or metaphysically always. Dr. Jyoti was wondering how to invite Mohanji to Sri Rampur. He received the invitation telepathically and he appeared physically. This is the truth of our Tradition and the stature of the Guru. On the way, Mohanji mentioned though, that we must finish all the agenda for the day and the meeting with Solaiki Maharaj was still pending. Mohanji always discourages procrastination. “Do not waste time. Do not take more lives. Complete everything today, as if tomorrow does not exist. Be desire less. Work is worship. Worship every moment. This is perpetual meditation and you need do nothing else”. The meeting with Maharaj also took place. He welcomed Mohanji and all of us with a lot of love. He presented us with Sai Baba’s sacred udi (ash) and a Sai Naam band of cloth around our neck. We felt very blessed. Baba blessed the whole day and prepared the entire day for us. We truly felt so fulfilled and blissful. 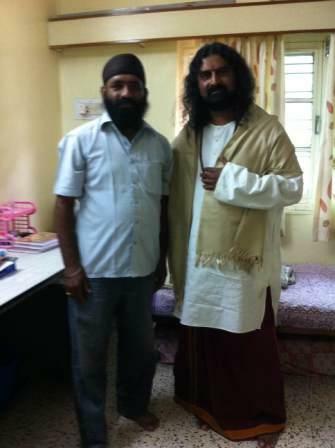 After Mohanji presented Solaiki Maharaj with the packet of dry fruits He had brought for him, we all left for Thane. Enroute somewhere, I could clearly sense that Mohanji was not in His physical body. Though he was physically there with us in the car, He was in other planes. The meditation was happening in Muscat and later we understood that a few devotees had gathered at His residence in Muscat for the Thursday meditation. He visited them and came back to his body! All those who connect with him are in His consciousness. Sadguru is never free yet always in a liberated state, full of love and compassion for His devotees. We reached Thane at around midnight. Yet another intense pilgrimage day, full of bliss! Two days of spiritual abundance. Again my total surrender and deep heartfelt gratitude to our Sadguru Mohanji, with whose grace and blessings all this was possible, and who used me as His instrument to write an account of the pilgrimages! It is He who inspired me to do so and it is He who was writing through me for the general awareness of everyone. I surrender this at the Lotus feet of our Grand Tradition and all the Masters represented through Mohanji.